That should be a clash of giants when you Yamato is finished. The model is everywhere acclaimes as one of Halinskis finest. You picked a really difficult first project. Most of us would pick something much less ambitious. I may never try one wiith so many anti aircraft weapons. It is very tedious work, I am sure. Beautiful job! Certainly there are some ways to improve that kind of models. underwater part of the ship. I haven't mastered it yet. But a lot of people use it here on kartonbau.de. Check out Peter's construction report on HMV-Bismarck 1:200. P.S. As you can see, by clicking on the picture you will get a bigger picture and for studying details you can click on this new picture. Yes, i've seen this technique already, however i've also seen much cleverer and more realistic one. I will find the pictures and attach them overe here. Can you otline this new technique (in general words)? It would great to see the pictures. I've seen that method, and it produces great result. However - I can imagine few things that are more tedious than this. The only thing that surprises me about GPM's Missouri is the color of the deck. Why on earth is it blue? It should be of the color of the wood! Don´t do that mistake and recolor an american wartime deck to wood. The most decks are colored in "Deck Blue 20-B" during WW2. The only exceptions are the flightdecks of carriers (colored in "Flightdeck Stain") and some camouflage shemes where some parts of the deck are colored in a different color than 20-B. Look here. 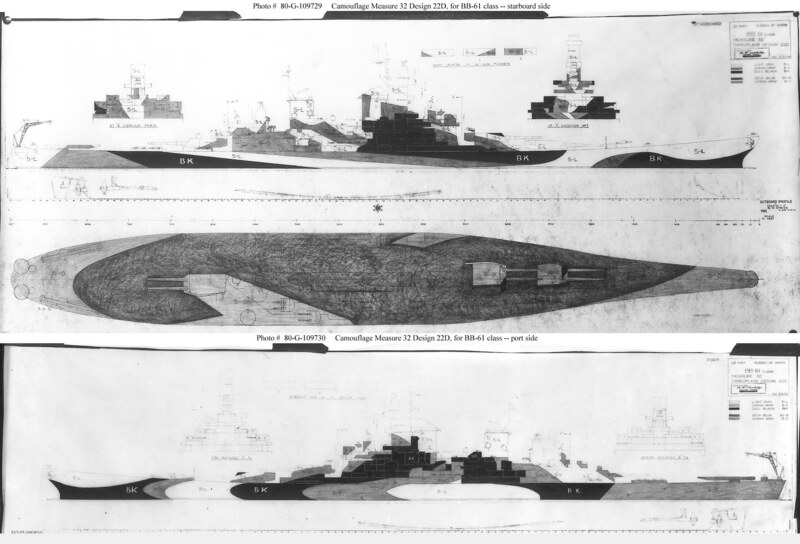 Under "Ship Camouflage Database" you could find the database of nearly all us ships and their camouflagesheme during war. Under "Camouflage Measures" you´ll find the general painting instruction for the shemes. The wooden decks came back after the surrender of japan. I didn't know! I'm really surprised! Actually the original GPMs colour scheme of top wiew is kind'a'wrong. I wouldn´t say that the GPM sheme is wrong. Take a look at this. This is the original USN painting instruction for the Iowa-Class. Which say (for me) that there are no smooth lines and no black on the decks. P.S. : I have the links to the .mil pictues too, but not everyone could open them. The small strip is not missing, I found it in your pictures. But the first upperdeck got a wrong colour. Wow! This plating technique is pretty impressive! However, as I see there's a little imperfection. Namely, the ribs are slightly visible. (it's relatively simple) and then, after having achieved very smooth hull, one can apply plating. Unfortunately it's too late for my HMV-Bismarck.